A Fairytale Romance. . .by Anna Campbell! Hi Lila! Thank you so much for inviting me to be your guest today. As you know, I absolutely adored AWAKENED BY A KISS and as I write this (back in September), I’ve already got my order in for THE PRINCESS IN HIS BED. I love the way you take those fairytale themes, shake them by the scruff of the neck, add dollops of spice and a leavening of heartfelt romance. And voila! We have a hot Fiery Tale to enchant us! There are a couple of reasons I’m utterly delighted to be here. One is I loved Lila’s debut – oh, I told you that, didn’t I? LOL! 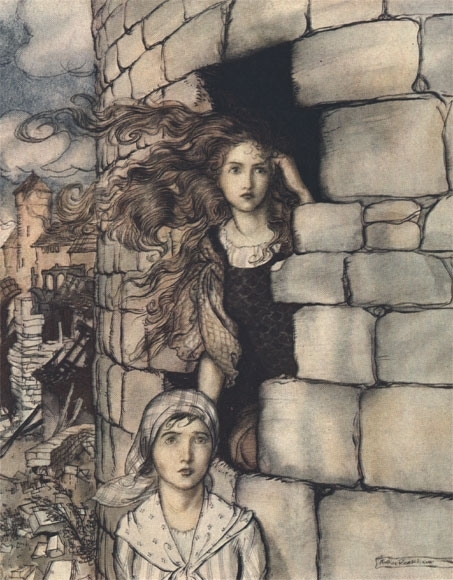 The second is that it gave me a chance to spend far too much time looking at beautiful Victorian fairytale illustrations. I hope you enjoy the ones I chose for this post! The final reason is that while the connection between fairytales and my stories isn’t as overt as Lila’s, I definitely write fairytale romance too! Except I seemed to be stuck in a fairytale rut (Ruttlestiltskin, perhaps?). My first five books were variations on Beauty and the Beast, which I have to say is still one of my favorite stories. I love that Beauty has to be brave and smart and steadfast to survive and that she falls in love with her Beast before she realises he’s really a prince. I love the fact that the Beast is your classic tortured hero. If any of you have read my books, you’ll know that tortured heroes R us over in Campbellandia. In my latest release MY RECKLESS SURRENDER, Beauty in the person of my heroine Diana isn’t quite as pure of heart as the girl in the fairytale. In fact, she’s got a lot of difficult learning ahead of her once she sets foot in the Beast’s lair. But the story still follows the basic shape of the fairytale. And then we come to my next book which is out in May 2011 – yeah, I’m right in between releases here! MIDNIGHT’S WILD PASSION has been in many ways a departure for me. Not least because it’s the closest I’ve ever come to writing a classic Regency romance. The heroine Antonia is a paid chaperone with secrets to hide. The hero Nicholas is a rake out to do no good. When she steps in to prevent him fulfilling his planned revenge against his worst enemy, sparks fly and an unwilling love awakens. While that description mightn’t make it obvious, this story has definite touches of Cinderella, not least that a lot of the action takes place in ballrooms! Cinderella and The Ugly Duckling too. Not a Beast in sight! QUESTION: So what was the last romance you read and was there a fairytale connection? My favorite answer wins a signed copy of my most recent Beauty and the Beast romance MY RECKLESS SURRENDER. Good luck! Great to have you at the PRINCESS BLOG PARTY, Anna! :) She has generously opened up her giveaway WORLDWIDE. 1. Answer Anna’s question(s) below in your comment.